​Welcome to the life and times of John Collins, a 19th century English radical who played an important part in the Chartist Movement .. .. ..
Chartism - which was most active from 1838 to 1848 - was a British working class movement that stood for equal social and political reform. ​​Its 'sacred principle' was universal suffrage at a time when only one in eight people had the right to vote. 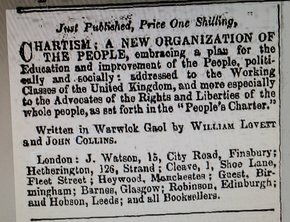 ​Chartism was named after The People's Charter being an outline of a proposed Act of Parliament that if passed into law would have made the electoral system more democratic. John Collins (1802-1852) was a leading spokesman for the Birmingham Political Union during a time of great political unrest. He was passionate about the rights of the working class, and was a top orator for the emerging Chartist Movement. ​Collins was largely responsible for bringing together the Scottish Radicals and the English Chartists in the Movement's struggle to change an unfair political system. He was one of the original 49 Delegates who attended the first General Convention of the Industrious Classes held in 1839 in the British capital. The purpose of of the Convention was to oversee and deliver a National Petition to Parliament seeking political reform. 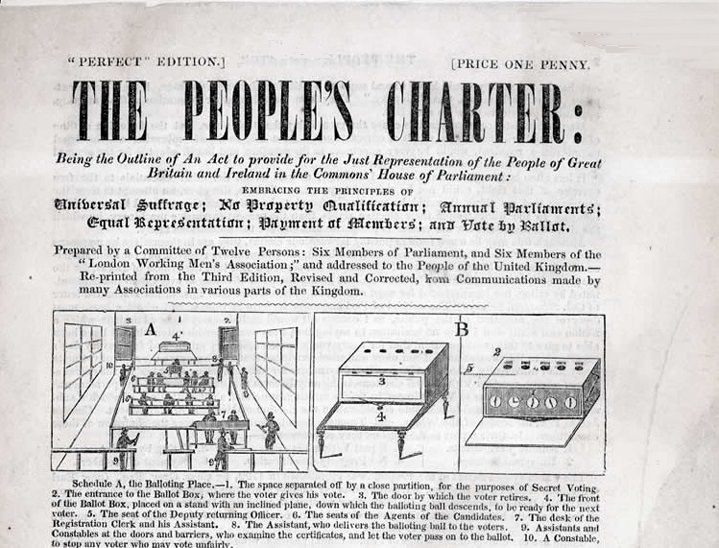 The People's Charter - Showing an example of a proposed Ballot Box. ​At the time, there was no such thing as a secret ballot. Although he came from the lower echelons of 19th century English society, John Collins was a thinking, self-educated man. In those days the ruling aristocracy believed education and intelligence were exclusive to that "elite class," and that they had an inalienable right to make laws and decisions without representation or input from the "uneducated rabble." 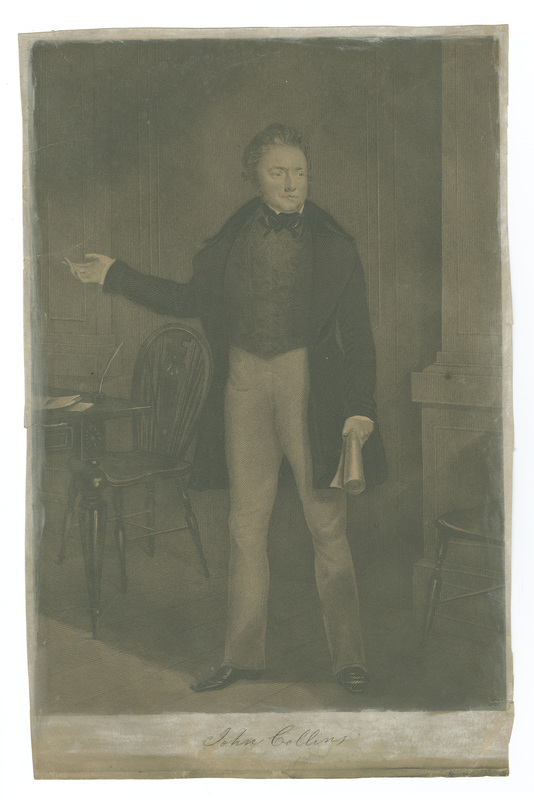 ​Collins strongly disagreed with this exclusion policy and he became a vigorous campaigner for the Chartist Movement. He believed there would be no security for the working class until they had the right to vote, and he was prepared to risk his life and liberty for that cause. ﻿Chartists leaders fell into two main groups: those who stood for intimidation and "physical force," and those, including John Collins, who preferred more peaceful and intellectual "moral force" solutions to gain reforms. The government did not approve of either group, and in the summer of 1839 Collins and fellow "moral force" chartist, William Lovett, fell foul of the establishment when the men criticized police brutality during a Chartist convention in Birmingham. ​Arrested on charges of sedition (rebellious conduct and writings) the two men were sentenced to twelve months in Warwick Gaol. Their mistreatment in gaol was the subject of much debate in Parliament and newspapers nationwide. In spite of their wretched prison existence, Lovett and Collins used their time in gaol to write a small book entitled: Chartism: A New Organization of the People. It reads like a finely detailed blueprint on how to improve society by providing access to education and (non-alcoholic) entertainment and enlightenment for the working class. ​Far ahead of the times, it called for such things as public schools and libraries as well as recommendations for clean, wholesome living. The content of the book, with its emphasis on education, eventually became known as the "New Move" which in turn led to the formation of The National Association of the United Kingdom. 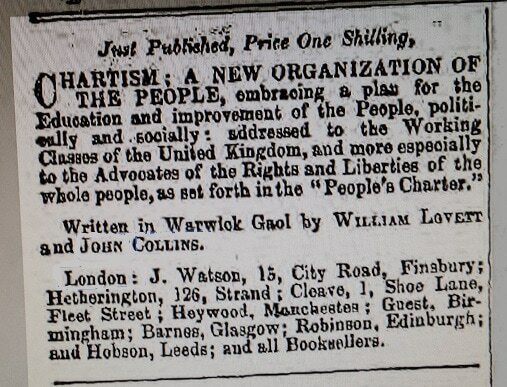 Chartism: A New Organization of the People goes on sale. This isn't to say John Collins was unique. There were many Chartist heroes involved in the struggle for political justice including those more important and famous, those who were either imprisoned like him or transported from their homeland, and still more who have long since been forgotten. Nevertheless, Collins has a place of honour in the annals of the British Chartist Movement, and especially in the history of his home town of Birmingham, England. His name is scattered throughout literature and on the Internet, but most of that is brief and, including certain errors, often repetitious. This is not surprising since he never sought the limelight and there is no autobiography or memoir, and no large collection of letters or memorabilia (that we know of) regarding Collins and his public or private life. - Go to the ​Content Page to browse the list of Pages on the entire website. A way to help give John Collins the acknowledgement he is long overdue, without costing you a single penny, is to click on "Like." Thank You !